We're really excited to announce the release of AppTracker 4.0. There has been a huge amount of effort in developing the Migration Planning Toolkit to enable project managers to better plan and manage their migrations. With last year's focus on connecting to the outside world, we are now able to provide answers to questions such as "When can I migrate the Finance team?" This work has lead to the final release of the AppTracker Application Prioritisation (AAP) report where the tool recommends which applications should be packaged in which order, allowing organisations to start the deployment phase of their migration earlier. In AppTracker 4.0 we've focused a lot more on communication with the users. The email templates have been greatly updated and its now possible to send ten custom emails to users during the migration process. This fits in with all the T-minus planning reporting were continuing to work on. Also added to this release are Blueprint Filters, Requested by Who Report and as a much requested bonus; the ability to Save Data Mining Reports for future use. Connections to Active Directory, Centrix, Systrack and Liquidware Labs as well as the ability to import geographical information from property services has allowed us to be able to answer questions such as "How many applications does the Finance department in Leeds use? Are those applications ready for deployment now? Will they be ready for migration in April?" 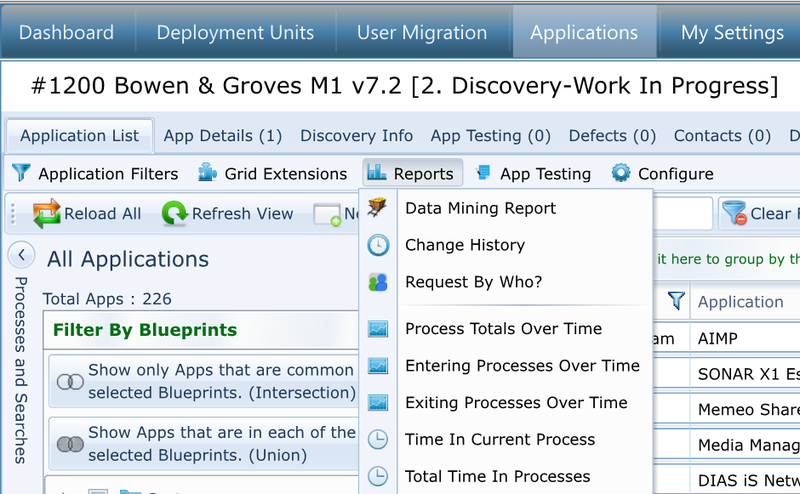 The really exciting development is that the AAP report shows you which of your applications to package first, allowing you to start the deployment phase of your migration earlier. During the lifecycle of a migration project, it is often necessary to communicate with the users and tell them exactly what is happening and what the next steps are. Whether it's a "Welcome to the project", "Five days to go", "Migration day" or "Satisfaction Survey" email, it's important to be able to use any of the information held in the AppTracker to get that message across. 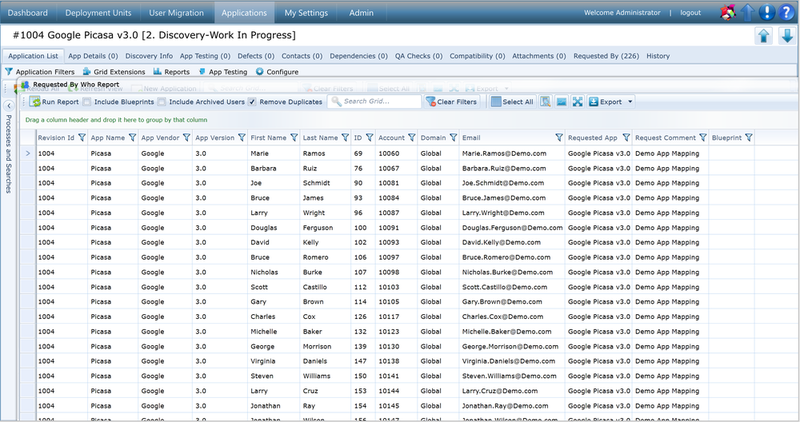 AppTracker now has the ability to send customisable emails (using templates) directly from the User Migration module. All you need to do is select the users, right-click and select which email template you want to send out. The HTML formatted email templates can be branded and designed in any way you chose. Information from any field in AppTracker, including which applications are used by each user can be added by simply including a simple formatted token. Emails can now also link back to questionnaires so further knowledge may be gathered throughout the migration process. As we delve further into the data available to AppTracker through imports, connections and manual updates we often come up against the challenge of finding what's common to two areas. For example we might want to see what applications or users are associated with a specific blueprint such as all the apps in the Leeds office or all the apps used by Finance. What happens when we want to see applications that are common to both, i.e show me all the applications associated with the Leeds and the Finance blueprints. This is where we want to start drilling down into our blueprint data. Although this was possible in previous versions of AppTracker it was never very intuitive. Show all Apps that are common: For example if you selected one Department i.e. Finance and one Location i.e. Leeds you would see all of apps used by the Finance Department in Leeds. Show Apps that are in each Blueprint: For example we could select the Marketing and the Sales blueprints to see which applications are used by both these departments. The Requested by Who Report has been a requirement of many of our customers. When collecting Application to User mapping data you might often find yourself in the position of asking "Just who uses these applications, where are they located and why do they use them". This report lets you quickly answer that question. 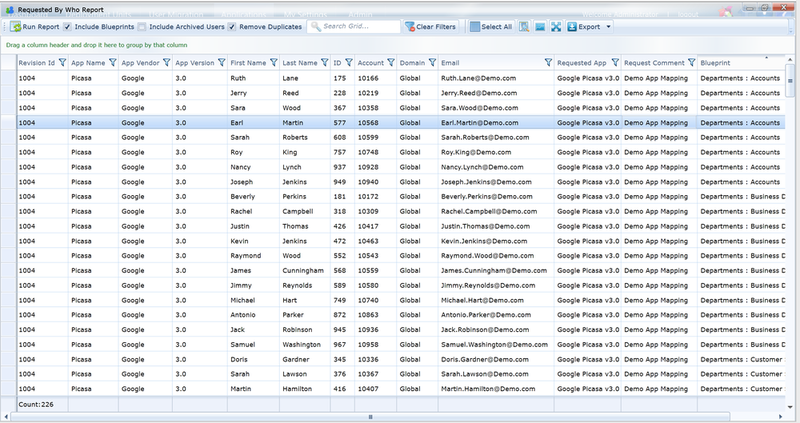 Select an application or number of applications and click on the Reports button. Select "Request by Who?" It's pretty useful as it is, but if you want to drill down further, you can select to include blueprints. 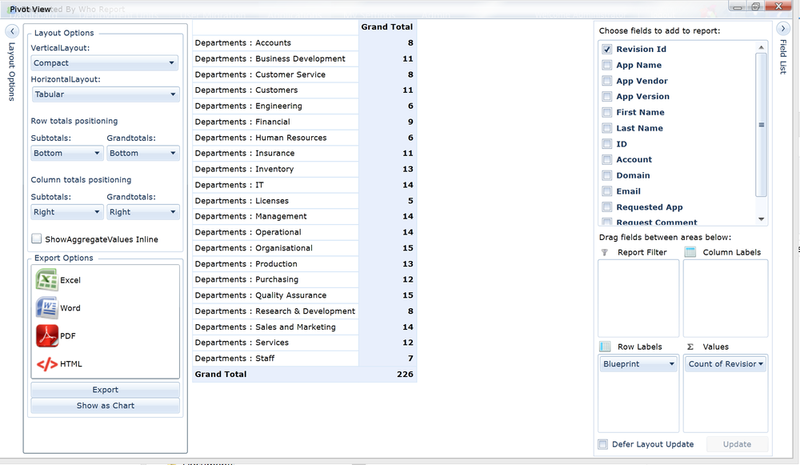 In the next example I select this option, re-run the report and then filter to just see Department blueprints. Be careful if you're producing a report on more than one app here as you will potentially be returning a huge amount of data. One of the main feature requests over the past few months has been the ability to save Data Mining Reports for future use. This is especially useful for reports that are used on a daily or weekly basis where a large number of fields are required. Type in the report name and click Save Report. Now whenever you wish to re-run the report you can just click on the "Select Saved Report" button, chose the report you wish to run and then click "Run Report". If you wish to delete a saved report then just click on the "Select Saved Report" button and click the "X" next to the report you wish to remove. This very simple addition should save some people a significant amount of time over the next few weeks. That completes this blog post covering the new features in AppTracker 4.0. We're always interested in feedback so please feel free to post a comment or get in touch. Older Post250,000 users migrations being managed by AppTracker!